My gut feeling when looking at what’s available now and what it needs to do is that the successor to 35 mm film is, indeed, digital APS-C. Full-frame is a little too hot (most lenses at most apertures and most focal lengths can’t quite keep up with the demands of the format, and the chips are difficult and expensive to produce, at least at the current state of the art), while 4/3 is a little too cold (Olympus has been forced to come out with monster f/2.0 zooms to provide even rudimentary available-light capacity, given the comparatively poor high-ISO performance of at least the current 4/3 sensors), while APS-C is just right — the sensors sharp enough and fast enough for almost any purpose, without putting too burdensome demands on the lenses. I agree with him whole-heartedly. It is not that I wouldn’t jump at a 35mm sensor if I could afford it, it is that I don’t because I can’t. Now the Nyquist-Shannon theorem states if you want to produce that spatial accuracy in analog medium (printout) then you must sample at 2x that resolution, or 300dpi. Do the math and you end up with 6 megapixels as the magic number—the resolution of the Nikon D70. Obviously dSLR sensors reach that (or better) in an APS-C sensor. Heck, there are some pocket cameras that reach that. Well why doesn’t a pocket camera size replace dSLR? …at 3+ megapixels, proving the rule again. A 4×5″ print by my math only requires 2.5megapixels—the same resolution as my old Olympus C-2500L. Good enough for consumer snapshots, anything else is just for cropping or that blow-up of a cherished photo which is becoming increasingly common at digital photo finishing places. So why don’t not a dSLR smaller than APS-C? Because the nasty corollary, as you get smaller, photon count on the sensor gets smaller and noise gets larger. (Olympus E-500) ƒ2.2, 1/160sec, iso400, 55mm. 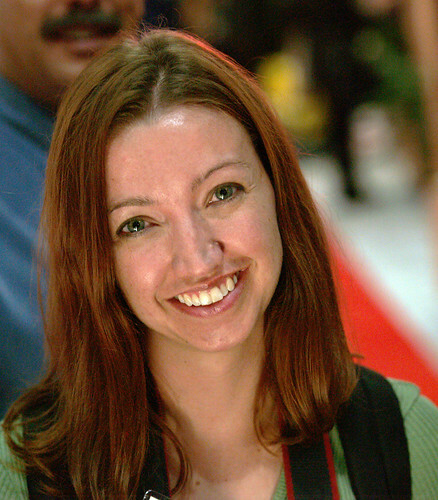 A shot taken a trade show by Ryan using the 35-100mm f/2. Think this is good enough? View it at 6 megapixel. “E-500: Rachel through the f/2 zoom” by carpeicthus. ( Nikon D70 ) ƒ3.2, 1/640sec, iso200, 70mm, UV, VR. Why are you carrying a dSLR anyway? In most shooting situations, a bridge will do just as well. You are doing it for lower depth-of-field for candid portraiture, lower noise, a variety of lens choices. I hardly call a $3500 lens in the sweet spot of anybody’s budget. That is a big problem for Olympus. Does that make 35mm dead? No. At the annex of my local photography shop, I see a number of people getting their 4×5 or full frame cameras repaired or buying equipment for them. It’s the mainstream we are arguing here and the mainstream has already switched to pocket cameras. The question here is what is the ideal interchangeable lens system for dSLR photography. I think it is APS-C and I claimed that historical trends are on my side. Maybe I’m wrong. Maybe because of all our investment in 35mm glass, we want a 35mm sensor to go along with it. Maybe Nikon’s DX will be dead the way Canon’s AF-S surely is. Maybe APS-C will get squeezed between the full-frame and the pocket camera. My best glass is not DX, and the most expensive DX glass I have (12-24mm f/4) is to offset a weakness in the APS-C size at wide angles. All I did was speculate that Canon left the door to the APS-C market dangerously open to Nikon and others, and implied that Canon’s split-commitment only serves as a signal for Canon photographers to stop buying EF-S lenses and saving pennies for the 5D. Personally, I believe there is a critical mass of APS-C lenses and APS-C sensors—it has reached that sweet spot just under the wire. But if you buy a 35mm dSLR, because of film, there will be someone around to service it and to sell you equipment far in the future. We can hang out together with the 4×5 and full-frame people in the photo store annex of the future, while the rest of the world goes to the main store to buy tiny fiber optic camera the size of our navel to take photos. Pingback: The Woodwork » Blog Archive » When did you go digital? Pingback: The Woodwork » Blog Archive » More foot in mouth. I hate to say this but that ISO 400 shot of the e-500 looks suspect. Maybe it was developed the wrong way? I can vouch that the e-330 doesn’t have that kind of noise at ISO 400, and from my experience with my own e-300 which uses the same sensor of the e-500, at ISO 400 the noise shouldn’t be that visible particularly at the size this website is showing it. I think that’s weird. Was this a RAW file? I can believe that maybe in RAW by default it would look that way, but certainly not from jpeg.